So you want to learn ER diagrams? This ER diagram tutorial will cover their usage, history, symbols, notations and how to use our ER diagram software to draw them. We’ve also added some templates for you to get started quickly. They are also known as ERD’s or ER models. Click on the below links if you want to learn something specific about ER diagrams. Although data modeling has become a necessity around 1970’s there was no standard way to model databases or business processes. Although many solutions were proposed and discussed none were widely adopted. Peter Chen is credited with introducing the widely adopted ER model in his paper “The Entity Relationship Model-Toward a Unified View of Data“. The focus was on entities and relationships and he introduced a diagramming representation for database design as well. His model was inspired by the data structure diagrams introduced by Charles Bachman. One of the early forms of ER diagrams, Bachman diagrams are named after him. For a detailed history of ER diagrams and the evaluation of data modeling, refer this article. What are the uses of ER diagrams? Where are they used? Although they can be used to model almost any system they are primarily used in the following areas. They are widely used to design relational databases. The entities in the ER schema become tables, attributes and converted the database schema. Since they can be used to visualize database tables and their relationships it’s commonly used for database troubleshooting as well. Entity relationship diagrams are used in software engineering during the planning stages of the software project. They help to identify different system elements and their relationships with each other. 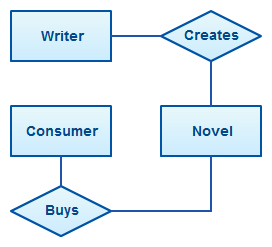 It is often used as the basis for data flow diagrams or DFD’s as they are commonly known. 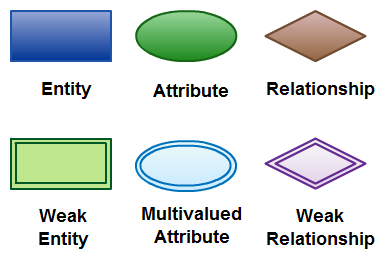 In the diagram, the information inside the oval shapes are attributes of a particular entity. There are three basic elements in an ER Diagram: entity, attribute, relationship. There are more elements which are based on the main elements. They are weak entity, multi valued attribute, derived attribute, weak relationship, and recursive relationship. Cardinality and ordinality are two other notations used in ER diagrams to further define relationships. An entity can be a person, place, event, or object that is relevant to a given system. For example, a school system may include students, teachers, major courses, subjects, fees, and other items. 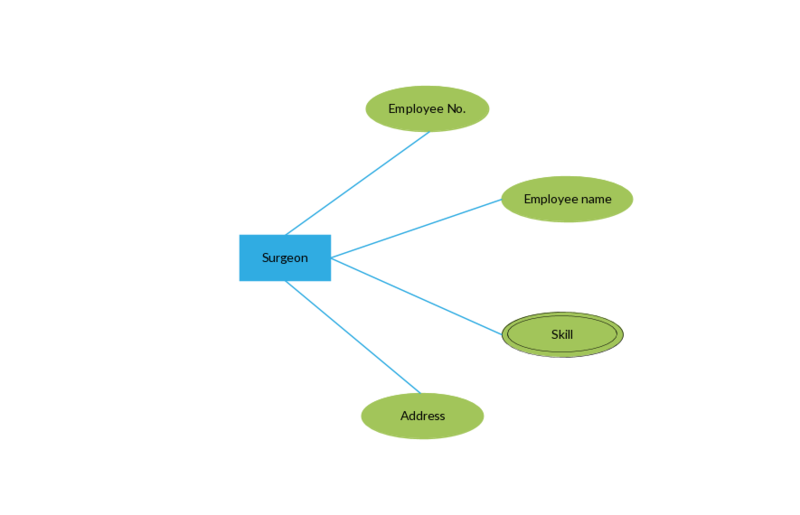 Entities are represented in ER diagrams by a rectangle and named using singular nouns. A weak entity is an entity that depends on the existence of another entity. In more technical terms it can be defined as an entity that cannot be identified by its own attributes. It uses a foreign key combined with its attributed to form the primary key. An entity like order item is a good example for this. The order item will be meaningless without an order so it depends on the existence of the order. An attribute is a property, trait, or characteristic of an entity, relationship, or another attribute. For example, the attribute Inventory Item Name is an attribute of the entity Inventory Item. An entity can have as many attributes as necessary. Meanwhile, attributes can also have their own specific attributes. 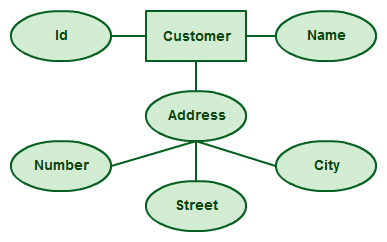 For example, the attribute “customer address” can have the attributes number, street, city, and state. These are called composite attributes. Note that some top level ER diagrams do not show attributes for the sake of simplicity. In those that do, however, attributes are represented by oval shapes. If an attribute can have more than one value it is called a multi-valued attribute. It is important to note that this is different from an attribute having its own attributes. For example, a teacher entity can have multiple subject values. An attribute based on another attribute. This is found rarely in ER diagrams. 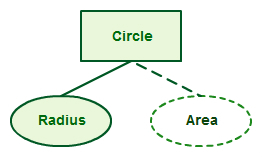 For example, for a circle, the area can be derived from the radius. A relationship describes how entities interact. For example, the entity “Carpenter” may be related to the entity “table” by the relationship “builds” or “makes”. Relationships are represented by diamond shapes and are labeled using verbs. If the same entity participates more than once in a relationship it is known as a recursive relationship. 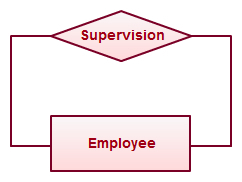 In the below example an employee can be a supervisor and be supervised, so there is a recursive relationship. These two further defines relationships between entities by placing the relationship in the context of numbers. In an email system, for example, one account can have multiple contacts. The relationship, in this case, follows a “one to many” model. There are a number of notations used to present cardinality in ER diagrams. Chen, UML, Crow’s foot, Bachman are some of the popular notations. Creately supports Chen, UML and Crow’s foot notations.The following example uses UML to show cardinality. Below points show how to go about creating an ER diagram. Identify all the entities in the system. An entity should appear only once in a particular diagram. Create rectangles for all entities and name them properly. Identify relationships between entities. Connect them using a line and add a diamond in the middle describing the relationship. Add attributes for entities. Give meaningful attribute names so they can be understood easily. Sounds simple right? In a complex system, it can be a nightmare to identify the relationships. This is something you’ll perfect only with practice. Provide a precise and appropriate name for each entity, attribute, and relationship in the diagram. Terms that are simple and familiar always beats vague, technical-sounding words. In naming entities, remember to use singular nouns. However, adjectives may be used to distinguish entities belonging to the same class (part-time employee and full-time employee, for example). Meanwhile attribute names must be meaningful, unique, system-independent, and easily understandable. Remove vague, redundant or unnecessary relationships between entities. Never connect a relationship to another relationship. Make effective use of colors. You can use colors to classify similar entities or to highlight key areas in your diagrams. You can draw entity relationship diagrams manually, especially when you are just informally showing simple systems to your peers. However, for more complex systems and for external audiences, you need diagramming software such as Creately’s to craft visually engaging and precise ER diagrams. The ER diagram software offered by Creately as an online service is pretty easy to use and is a lot more affordable than purchasing licensed software. It is also perfectly suited for development teams because of its strong support for collaboration. Below are some ER diagram templates so you can get started quickly. Clicking on the image and in the new page that opens click the “Use as Template” button. For more templates check our ER diagram templates section. 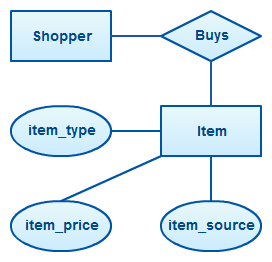 ER diagrams constitute a very useful framework for creating and manipulating databases. First, ER diagrams are easy to understand and do not require a person to undergo extensive training to be able to work with it efficiently and accurately. This means that designers can use ER diagrams to easily communicate with developers, customers, and end users, regardless of their IT proficiency. Second, ER diagrams are readily translatable into relational tables which can be used to quickly build databases. In addition, ER diagrams can directly be used by database developers as the blueprint for implementing data in specific software applications. Lastly, ER diagrams may be applied in other contexts such as describing the different relationships and operations within an organization. I’ve done my best to cover all you need to know about ER diagrams. If you think I’ve missed some part make sure to mention that in the comments sections. It’s a good place to ask questions too. If a question is asked frequently I will add it to the frequently asked questions section. 1. Entity-relationship model as published on Wikipedia. Very nice detailed description except for the cardinality part. If that can also be elaborated a little, then it can be the best place to learn ERDs. If I have big er diagram which can not plot in one page what should I have to do?? this explanation is very good and fairly easy to understand. I might have to review Cardinality and Ordinality once or twice more but the rest was very concise and clear. Thank you. Explanation is so good and easily understandable. I have some doubts. I’ve taken a DBMS-1 course in my Master’s and my professor taught me ERD differently. For relationships he used triangle, not a diamond. In cardinality he didn’t use UML, Chen or Crow’s foot notations. He used some thing different, like Thick lines, thin lines, one-sided arrows etc. Could you help me to figure out what notations are those and also I am curious enough to know which notation is used widely. Please help me with this. Thank you. This is understandable! Very very Nice tutorial Thank you Very Much. I’d a Question: Which kind of Attribute is the Date? It’s Really Useful thank you..
Got satisfied with what is needed.Thank you. very nice!!!! esay to understand.Really nice article.Thanks!!!! keep doing this it will be very helpfull…..
A unique blog as your name … Very simple and easy.. relevant examples !! keep up the good work ….. Thanks Dzinaishe. Glad you like it. Feel free to tweet and share it across social networks. Thanks for the post. Very good explanation. Good color highlights to explain the diagrams. Thanks Sheela, Glad you enjoyed it. Never seen this notation before… everything looks like 1:1 … mixes attribute relations, entity relations, and verbs. Anyway.. at least it is a notation. exellent explanation for ER diagram………. Good definition,that a ER diagram may has. It is really ultimate explanation. Thanks to creately.com team. Awesome guide for ERD, i understand a lot of about creating a good erds in half hour. Well explained…. So help full…. Many readers will be benefiting from your blog. Thanks for listing the ERP Diagrams which is necessary software for businesses. Thanks for sharing such a useful diagrams list..
A Supplier located in only one city supplies various parts for the project to different companies located in various cities. Draw the “E-R” for the supplier and parts database. VERY NICE THIS EXPLAINATION , I LIKE ITS SIMPLE SOLUTION THANK U ………….. The author explained the ER model in a simple & understandable language. Very descriptive and useful article. Helped me for my SE project. Can someone please explain all the notations used in er diagram? What about the tables in a database which are not interrelated? How to show ER diagram of a complete database with few related tables and few other non-related tables. It’s not necessary that each and every table in a database in interrelated. I want draw a ERD of website news? Good explanation for ER-Diagrams,it really helped me in my examination. good .u can also draw the attributes from the entity tablle as a little ballon , on top of the ballon u can write the entity names. very very nice article. really helped me out.. . .
the most good and easy to understand explanation,thank you…. thanxs…very simple and easy to understand…. You can add relationship sets between two entities after you are done making entity sets right ? Thanks dear. but i also need to know about the ‘arrow headed line’ and ‘double lines’ . Can we use arrow heads in ER diagrams? If it is, then how? Best explanation for beginners ! I required this for my dbms exam in the morning. This article is so well explained enough for a one legged man to run a marathon. Thank you dear editor. what we can show relationship of PK and FK using ER Diagram..??? Thanks. My concept is clear from it. Very Nice Answer and m really satisfied from it and also my concept is clear from it . after visit this website i have believe Insha Allah i will make easilly. you’re a genius,i cherished you. nice,and very helpful for our subejct in database management system………. thanks dude very usefull for me……. Relationships can have their own attributes as well. I have still confusion on creating a relationship between two entities,does relationship block have also attributes of its own please help me with this. We’ll try to add some example questions in the future. very nice explanation. Thank you for the time. Its really good. Understanding the basic concepts of ER diagram with simple language with very good examples. It is easy to for us to know the contents. Thank You Sir. thanks,very good explanation for all. I HAVE GOTE A GOOD HELP.THANK U! hey, brow.. nice job.. thanks for this.. it gave us so much help.. thanks brow..
what exactly connector image in entity relationship diagram???? Examples are very simple and useful to understand ER Diagram.But if you take a simpl eproblem statement and explain how to identify entity,relationships etc… it would be more helpful to understand. Inder, I know I’m replying quite late, but tell me if the correct answer is what I thought: to put every relation as 1..n, with one exception: the teacher/student relation. Here I put 1 in the Teacher side and 1..n in the student’s side. Is it correct? Thanks! Thank you sir ,I don’t know how to create a ERD, but now I clear this. Thanks for sharing , it is very useful for database designing. Hi, I have to do an ER model for a travel game app but we have not been shown how in college. Can anyone please give me some ideas on how to go about this. The player or multiple players are required to navigate their way to the objective location using the transport infrastructure in a city or area, the games A.I places them in. The maps will be updated on a frequent basis to add variety to the user’s experience. A very clear explanation of ERD with the aid of diagrams.thanx. Thank u ,this was very big help for us…. A lucid and elaborate explanation. Appreciable. Very to the point and clear explanation. Good read to refresh the concepts just in few minutes. Thanks. this is very useful for us. so easy to understand. very nice simple and attractive explanations. Jus wrote my Database exam, wish id seen this much earlier. I am an Engineering Student and needed this for my exams. Information in this site are very usefull.tankx v m.
A very good explanation for ER diagrams. The model that you espouse (attributes in ovoids, aka ‘the lollipop model’) is OK for small systems with very limited number of attributes per entity. Unfortunately, some students try to use it for llarger assignments (20 entities with up to 20 attributes per entity) and the whole model becomes unreadable unless they use A2-sized paper. If I never see another model of this type, it will too soon!! 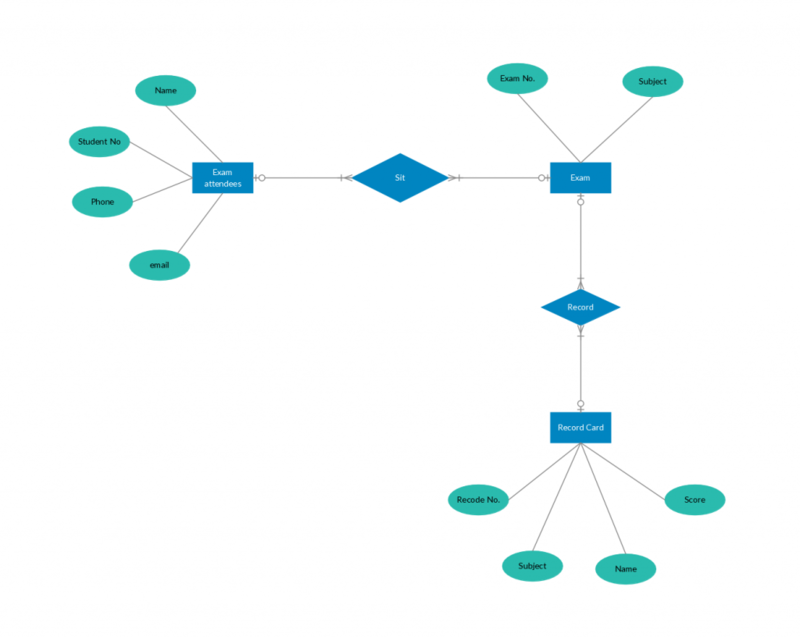 best sites for erd diagram. can any one tell me the date of the artical posted? ?